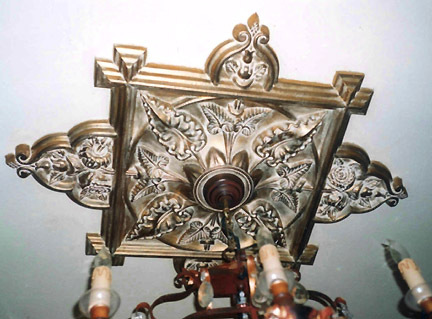 Bronze and gold iridescent waxes were applied to the white plaster surface of this ornate ceiling medallion. The surface was then buffed with steel wool, pulling color off some areas, and rubbing it into others. The resulting antiqued ornament provides a fitting accompaniment to the chandelier . Moraga, Ca, To see the medallion before treatment, click link below.